What is Camp Fleur de Lis? In 2012, the Louisiana District of Pilot International recognized the need for a retreat for adults with traumatic brain injuries (TBI) and started laying the ground work to make the Louisiana TBI Camp happen. Louisiana Pilots launched this project, funded by a gift from the former Pilot Club of Many. Camp Fleur de Lis is the Louisiana Pilot District public service project aimed at increasing awareness of brain injuries and ways to prevent them. TBI Camp is designed to provide adult traumatic brain injury survivors and their caregivers with an opportunity to come together and participate in a celebration of life in a camp-style environment. Want to be a part of this effort? Donations may be made to Louisiana Pilot TBI Camp Foundation or to any Louisiana District Pilot Club, such as Pilot Club of Denham Springs. Staff will be composed of volunteers from the community as well as Pilots and Anchors. There will also be medical staff available. Traumatic brain injury survivors need opportunities to feel they are special. Camp Fleur de Lis will provide an opportunity for them to experience a camp designed just for them. Participants and caregivers, Pilots, and Anchors will experience a weekend of opportunities that will take their breath away and make a lasting impact. Participants will leave with new found friendships, a feeling of self-worth, and a sense of belonging. TBI Survivors need to experience life in normal situations that may be denied to them because of their disability. Anchors and Pilots will be actively involved in all aspects of the camp. Camp participants from the state of Louisiana will have first choice for participation. Camp activities have been designed especially for campers who have survived a traumatic brain injury. The weekend camp will include fellowship, crafts, and recreational activities. What’s Happening at Camp Fleur de Lis? The day will start and end with a flag service and the time between will be packed with activities. A Camp Fleur de Lis weekend allows participants to meet new friends and to experience independence. The schedule fills the day and the evening with regular camp activities like Music and Singing, Art and Crafts, Bingo, a Mardi Gras Parade, Campfire, Devotional, and Dancing. Each night all the campers will gather for group activities. 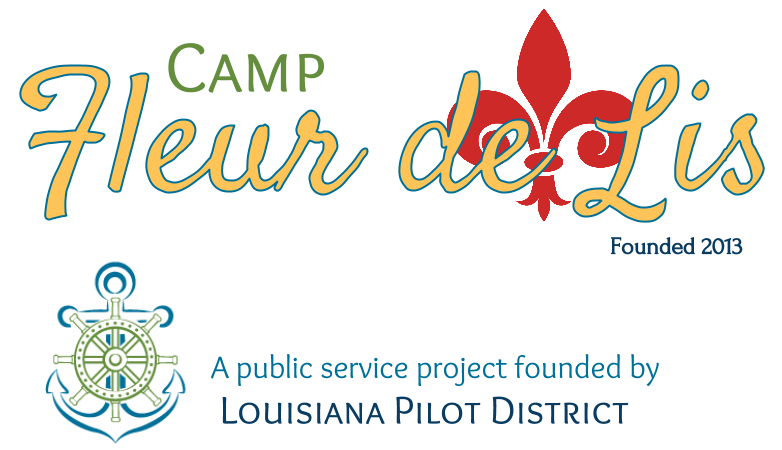 Camp Fleur de Lis is a retreat sponsored by the Louisiana District of Pilot International designed to provide adult traumatic brain injury (TBI) survivors and their caregivers with an opportunity to come participate in a weekend of relaxation and fellowship. Anchors and Pilots will be actively involved in all aspects of the camp. Camp activities have been designed especially for campers surviving from a traumatic brain injury. The weekend camp will include fellowship, crafts, and recreational activities. The Louisiana District Anchors will experience a hands on service project working with Pilots and will have a better understanding of what being a Pilot is all about. Individual Pilot clubs members will experience the camaraderie of a joint service project and will return to their individual communities seeking potential participants for future camps.